Equanimity in Bhagawat Geeta is rooted as a base. The literary meaning of equanimity is “calm mental state in all situation whether favorable or difficult” It is also said as “evenness of mind in all moment disregarding the situation like happiness and sadness”. It is the situation when the emotion ate mastered. The closer words for ‘equanimity’ could be “equable; even-tempered, dove, Pacific, stoicism, patient and uncomplaining”. When an individual is proactive and not affected by the situation, he is said to be equanimous. The secret of developing leadership is hidden in “equanimous state”. Leadership is the function of equanimity. The Sanskrit word for ‘equanimous’ is ‘samatva bhava’ It is the psychological homeostatic and people have the ability to face, to tolerate, to endure and to absorb the world of dualities which may manifest all the time. Bhagawat Geeta has given a great focus at equanimity. 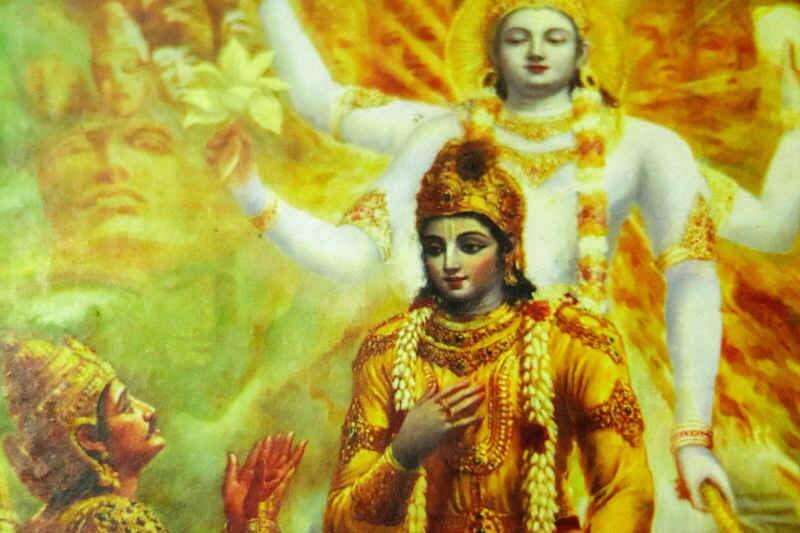 In chapter 2, verse 14 and 15 Lord Krishna says Arjuna, “The contacts between senses and sense objects, which arise the senses of heat and cold, rejoice and grief etc. are ephemeral, deciduous and fleeting; therefore, Arjuna, tolerate them. This is because the wise man to whom delight and distress are tantamount and who is not scorched by these plosives deserves for imperishability.” Equanimity in Bhagawat Geeta provides clear idea for mental balance. Lord Krishna keeps explaining as he was refusing to fight the war, and in the 38th verse, he says to Arjuna, “Accepting identical conquest and debacle, profit and deficit, enjoyment and agony, get ready for war; combating with this mental state you will not conveyance sin.” In 48th to 51st verse, Lord says, “Adhere your works instituted in Yoga, eschewing infatuation, and be equanimous in success and failure; equanimity (evenness of mind) is called ‘Yoga’. Through the conversation, in the 54th verse, Arjuna asks about the characteristics of a God-realized soul, stable or equanimous mind established is Samadhi- how such man walks, speaks, sit etc. So the Lord begins the description of such person from the 55th to 72nd verse (till the end of the 2nd chapter)-“When one completely casts off all cravings of mind, satisfies in the self through the joy of the self, he is called stable of mind or equipoised mind. He remains unperturbed amid sorrows and thirst for pleasure is no more. He is free from passion, fear, and anger. He is unattached to everything; neither rejoices nor recoils with good and evil. He withdraws his sense from the sense objects. Who does not enjoy sense objects, they turn away from him but the taste still persists. This taste disappears when he realizes the supreme. As attachment is not destructed, turbulent natured sense organs forcibly carry away even the mind of a wise man, who is practicing self-control. So the disciple should sit for meditation controlling all the sense, devoting himself and concentrating his mind to Lord. The man who thinks of sense objects creates an attachment for them, from attachment desire evolves. When desire is unfulfilled, it ensues anger. Anger arises delusion, delusion creates confusion of memory, from its loss of reason, and when reason is lost one goes to complete ruin. Merely, a self-disciplined sadhak achieves serenity of mind while enjoying the sense objects through his sense, which are under control and free from likes and dislikes. Then all his sorrows end. And intellect of such harmonious minded person withdrawing itself from all sides establishes in God. When mind and sense are not controlled, there cannot have determinate intellect and contemplation. There is no peace unless there is contemplation. And how there can be happiness without peace of mind. If any of the sense organs are attached to sense organ, that sense organ takes away his discrimination. Thus, he whose senses are total with strained from their objects; is said to possess a stable mind. That, for all beings, is night; God realized yogi, who is in the state of Divine Knowledge and supreme bliss, keeps awake. That, which is ever-changing, ephemeral worldly happiness, in which all beings keep awake, is like a night for the seer. He won’t be disturbed even if various enjoyments merge on him. He remains peace and won’t be hankering for such enjoyment. He who has renounced all the desires and travels being free from attachment, egoism, and thirst for pleasure attains tranquility. Such realized soul; having reached this state he overwhelms delusion. And stable in this state, even at the final moment, he attains Brahmic Bliss.” In this way, Krishna explained equanimity in Bhagawat Geeta. Krishna wants human non-reactive due to attraction and hatred. He suggests in chapter 3, verse 34,-“Craving and aversion are rooted in all sense-objects. A man should never let himself to be oscillated by them, forasmuch, they are two fundamental foes fixing in the path of his liberation.” Equanimity in Bhagawat Geeta is a concept to be free from all the external distraction. This concludes the part-I of Equanimity talk in Bhagawat Geeta. 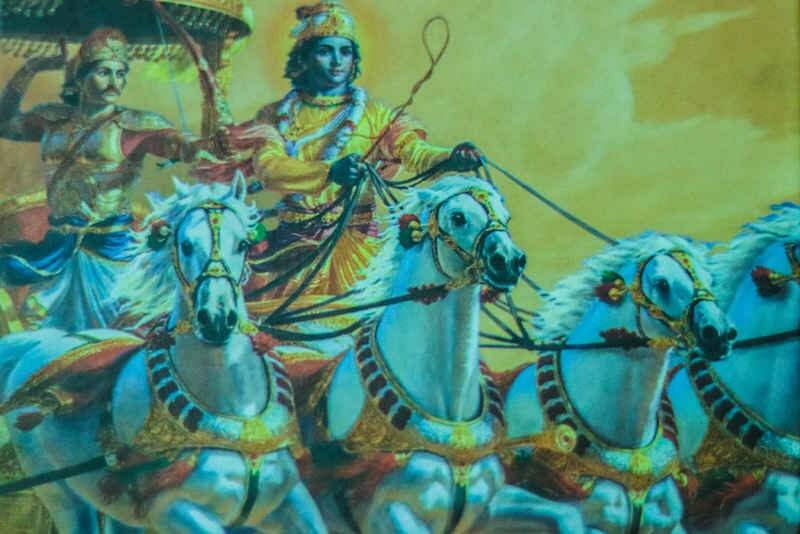 Click here to read Part-II of Equanimity talk in Bhagawat Geeta for complete knowledge. Patanjali is the authentic scientific writer about yoga ( Ashtanga Yoga ) in Hindu philosophy. Before him, many yogis wrote about yoga in their scriptures but their writings were not so clear that one can get the real guidance from that book. Patanjali has described the eight limbs of Ashtanga yoga system which is definitely workable. He has given the emphasis in the continuous process of yoga formula. Patanjali said, in his book, that yoga is to stop the fluctuation of our mind. According to Patanjali, if we follow the path of eight limbs of Ashtanga Yoga, we can get enlightened sooner or later. Yama is the first step of eight limbs of Ashtanga Yoga. Yama is the discipline that we should have to apply in our life. Yama helps us to be sincere. This is the part of self-restrain which helps us to grow up in the field of our spiritual purpose. Patanjali put this at the first part because every successful strategy starts from the purity of our mind, purity of our behavior. Patanjali distributes this yama in five parts. We have to practice to speak the truth. We shouldn’t promise faulty things that we won’t fulfill by our action. What we speak, we should do and what we do, we should speak. Our life’s every action should show the truthfulness. Our every effort in the life should show the reflection of the truth. The meaning of asteya is not to steal. We even don’t have to bring the feeling of stealing in our mind, according to Patanjali. We don’t have to take anything of anyone without the permission of the owner. This is the discipline that is applied by controlling our sexual power. Our sexual power should be transformed towards the upside of our body, so we restrain our sexual desire. In this process, we don’t have to suppress our sexual desire but we have to bring our attention to the knowledge of the supreme self. We have to make less our desire to the sensual happiness. We have to try to take pleasure in the matters which are related to the supreme power. In this formula, we practice to keep minimum things with us. This is the way of applying minimalism in our life. We should keep the things only that we need, but not which we want. If we can live in one cloth, we don’t have to use two. If we can live in two clothes, we don’t have to use three and so on. This is the second step of Ashtanga Yoga formula. Niyama helps us to go into the deeper level. This is the system which helps us to control ourselves in the process of yoga. There are five branches of Niyama. Saucha is the cleanliness of body and purity of the mind. Santosha means satisfaction by the situation where we are. It means we don’t have to be anything to be happy or to be satisfied. Tapa means the determination to continue our yoga at any cost. We have to be disciplined when we walk to get the destination of our yoga goal. Svadhyaya means to gain the knowledge of the spirituality. To study the knowledge from the Veda, the famous scripture of Hinduism. We have to learn the wisdom from the level of the words and of the actions. We have to apply the knowledge that we learn. If we apply the knowledge in our life, that becomes the knowledge in the level of experience. In this part, we dedicate ourselves to the supreme God. We sacrifice our deeds and all the events to the God. We practice believing completely in the God. This is the part that most of the people think is the real yoga. There is the concept that Asana is complete yoga but asana is only the part of Yoga. It is a special step in the eightfold path of Ashtanga yoga. This is a formula which can open the blockages of our body and mind. Our body has a lot of blockages and with the blockages, we can’t go ahead in the way of salvation. This is also the part of the common practice of yoga teaching and learning nowadays. Pranayam is the process of breathing which helps to bring the oxygen to every cell of our body. This is very useful to open the blockages of our mind. This can eliminate the diseases of our body and mind. It cleanses our body and mind. It makes us ready for the meditation because we can’t meditate fully until we are not free from the blockages of our mind. Pratyahara means to be near to the higher self or to be with the self rather than outside. We have to practice of self-awareness. Our focus should be in the inner world when we make our goal to be liberated in our life. Dharana is the concentration on something higher than us. This is the focfus of mind. We have to train our mind making it one-mindedness towards the higher self. Our only goal is to achieve higher step of spirituality to be enlightened. It is the level where we practice of stillness. Dhyana is the part that can happen in our life which cannot be practiced but it occurs in our life when we practice the level of concentration. When we practice concentration, we may suddenly experience Dhyan. This is the last part of Ashtanga Yoga (the destination point of Ashtanga Yoga). Samadhi is the state of being blessed by the ecstasy, the supreme happiness. This is a state of the union of our self with the supreme self. When we achieve this state, we never see the separateness in the world with anyone or anything. There is oneness with all the parts of the universe. Everything and everyone is harmonious. There are two types of Samadhi. This is the state of ecstasy that we get for a short period of time then we come out from the Samadhi. This is the first step of Samadhi and we can achieve unconditional Samadhi after practicing this in our life. This is the state of Samadhi from where we never should come out from the ecstasy. This is the state of complete blessing, complete unification with the supreme self. This is the ultimate goal of yoga. If we achieve this Samadhi, we have nothing to be achieved in our life anymore. We never have to separate from the highest existence of the world when we achieve this Samadhi. When we go through this eightfold path of yoga sutra (formula), we find that it is a systematic way of getting salvation in our life. Patanjali gives the exact technique which can lead us to the path of purification. It is not only the theoretical presentation of the facts but it is as practical as its theory if we apply it sincerely in our life with a teacher who has already got salvation by passing these eight limbs of yoga.